"Although synthetic and food-derived vitamin C appear to be equally bioavailable in humans, ingesting vitamin C as part of a whole food is considered preferable because of the concomitant consumption of numerous other macro- and micronutrients and phytochemicals, which will confer additional health benefits." Carr A et al., 2013. "There is little doubt, in our opinion, that treatment with ascorbate in amounts of 10 grams a day or more is of real value in extending the life of patients with advanced cancer." "In patients, the ascorbate concentration shown to induce cytotoxicity to cancer cells in vitro can only be achieved via IV administration." Venturelli S et al., 2015. "Our data imply that for future clinical applications, cancer patients should be oxygenated before and during ascorbate infusions to maximize the cytotoxic effect." Cancer patients should be oxygenated before and during ascorbate infusions. Sinnberg T et al., 2014. Hyperbaric oxygen or oxygen sensitizers have been suggested. ​ Venturelli S et al., 2015. High doses of ascorbic acid cause cell death. ​In the Sinnberg T et al. 2014 study, the researchers stated, "The cytotoxic effect (of vitamin C) is driven by the extra-cellular production of reactive oxygen species (ROS), e.g. hydrogen peroxide, making high-dose ascorbate a pro-oxidative anticancer pro-drug." To reiterate, only the IV administration of ascorbate will yield a large enough concentration to kill cancer cells. "In experimental tumor xenografts in mice, the intraperitoneal administration of 4 grams of ascorbate per kilogram of body weight results in the accumulation of 20-40 mM ascorbate and 500 nM ascorbate radical in the tissue." In a petri dish and in animal models, high dose ascorbic acid could kill cancer cells. Using high-dose ascorbate, the researchers conducted experiments on 60 cancer cell lines. The cancer cell lines, with normal oxygen, as stated previously, had an IC of 4.5+- 3.6 mM. But look at what happens when there is low oxygen (hypoxia) in the cancer cells: The IC jumped from 4.5+- 3 6 mM to 10.1 +- 5.9 mM. This was a 2.2-fold increase in resistance in the low oxygen cancer cells to the ascorbate therapy. When there is this low oxygen, hypoxic state, there is "enhanced cell survival, angiogenesis, glycolytic metabolism, and metastases". It is both this hypoxia and HIF-1 signaling (which promotes hypoxia) that are present in tumors and metastases and make them resistant to the ascorbate. This is due to the fact that there needs to be tons of oxygen for the ascorbate to induce the generation of ROS. It is the ROS, the hydrogen peroxide and the ascorbyl radicals, that do the killing of the cancer cells. The researchers suggest: "Our data imply that for future clinical application, cancer patients should be oxygenated before and during ascorbate infusions to maximize the cytotoxic effect." Sinnberg T et al., The ROS-Induced Cytotoxicity of Ascorbate is Attenuated by Hypoxia and HIF-1alpha in the NCI60 Cancer Cell Lines, J Cell Mol Med, 2014. + HYPERBARIC OXYGEN OR OXYGEN SENSITIZERS FOR BEST RESULTS! The same research team, right above, that recommended oxygenation before and during IV vitamin C treatments, further fleshed out the mechanisms of action of pharmacological doses of vitamin C on cancer cells in their 2015 study. Venturelli S et al. wrote, "In recent years, it became evident that high-dose ascorbate in the millimolar range bears selective cytotoxic effects on cancer cells in vitro and in vivo. This anticancer effect is dose dependent, catalyzed by serum components and mediated by reactive oxygen species and ascorbyl radicals, making ascorbate a pro-oxidative pro-drug that catalyzes hydrogen peroxide production in tissues instead of acting as a radical scavenger. It further depends on HIF-1 signaling and oxygen pressure, and shows a strong epigenetic signature." Stating that some compounds that exert "beneficial anticancer effects" do so because "some of these biological properties are linked to epigenetic mechanisms", the researchers discussed ascorbic acid and epigenetic changes. Of course, epigenetic changes do not alter the DNA and are potentially reversible. Epigenetic changes include histone acetylation and DNA methylation via DNA methlytransferases (DNMTs), which are cancer targets. All of these mechanisms regulate gene expression plus microRNAs (regulate gene expression). DNA methylation (the adding of a methyl group) usually helps suppress gene expression, and is needed for a million things, including suppressing carcinogenesis. The demethylation of histones and DNA by 2-oxoglutarate-dependent dioxygenases depend on oxygen and 2-oxoglutarate-dependent as obligatory substrates and on iron and ascorbate as cofactors." The researchers, in a recent study, presented "novel evidence that in human metastatic melanoma cells only pharmacological doses of ascorbate induce substantial epigenetic changes. ... ... Pharmacological levels of ascorbate in the mM range strongly inhibit cellular DNMTs in melanoma cells lines." Then, "Owing to the new-found epigenetic activity of pharmacological ascorbate on DNMTs", the researchers wondered what the impact was on the microRNAs. Using either a regular dose of ascorbate or a high-dose of ascorbate in melanoma cells, there were 151 mcroRNAs that were differently expressed compared to the cells not exposed to the ascorbate. And most of these upregulated microRNAs are "key players" in tumor suppression, "Most interestingly, the ascorbate mediated upregulated microRNAs in melanoma correlated with an increased overall survival of breast cancer patients .... of the MIRUMIR database." Conclusion: "This data implies that to circumvent endogenous resistance mechanism induced by hypoxia and HIF-1a signaling, the application of high-dose ascorbate on cancer patients in clinical trials should be complemented by oxygenation (e.g., via hyperbaric oxygen treatment or the application of an oxygen-sensitizer) of the patient, which decreases HIF-1 activity and increases the interaction of ascorbic acid with oxygen to assure for adequate oxygen necessary for ascorbate-driven ROS generation." Thus, the researchers recommend that this efficacious ascorbate therapy for cancer be assessed "in cancer-bearing animal models for the optimization of an efficacious therapy regimen (e.g., combination with hyperbaric oxygen or O2 -sensitizers) that subsequently need to be evaluated in clinical trials." Venturelli S et al., Molecular Mechanisms of Pharmacological Doses of Ascorbate on Cancer Cells, Wien Med Wochenschr, 2015. Synthetic? "The whole complex (vitamin C)... has other natural factors. The synthetic vitamin will have just the ‘active ingredients’ of ascorbic acid and other additives." LeShay Canady. Radioactive? Dr. Hulda Clark articulated another caution about adding ascorbic acid for cancer patients. "It is a dilemma, because nearly all synthetic vitamin C has radioactivity from its chlorine disinfectant that gives it 'food grade' status. Search for unchlorinated vitamin C." Your radioactive ascorbic acid might even light up under a black light! THE "PECULIARITIES" OF ASCORBIC ACID - AFTER LOW-DOSE RADIATION IN CANCER CELLS -YIKES! DOES ASCORBIC ACID TURN INTO A CO-MUTAGEN ALONG WITH X-RAYS? ​The Domina EA et al. 2014 study discussed the "peculiarities" of ascorbic acid. These Russian researchers wanted to study the co-mutagen potential of ascorbic acid in the post-Chernobyl radiation cancer-causing background. The researchers stated, "One of the important components of primary radiogenic cancer prevention is taking into account the effect of co-mutagens on humans. These are compounds that, while not having mutagenic properties on their own, can significantly modify (enhance) effects of known mutagens of chemical nature. .... Ascorbic acid had been designated as a 'signal molecule causing specific activity in cells''.."
Why not test ascorbic acid? The researchers chose to study peripheral blood lymphocytes, which are particularly sensitive to radiation. "The peripheral blood lymphocytes' culture was exposed to x-ray radiation in G0 and G2-phases of cell cycle. Immediately after the irradiation, the culture was treated with ascorbic acid in concentrations of 20.0-80.0 ug/ml of blood." What happened in the lymphocytes of cancer patients? "In the blood lymphocytes of cancer patients, the level of genetic damage was increased 1.7 times after combined treatment with low dose irradiation and ascorbic acid in comparison with irradiation alone, which suggests the co-mutagenic instead of radioprotective effect of ascorbic acid." Conclusion: Genome destabiliztion enhancement of irradiated in vitro human somatic cells under ascorbic acid effect is due to its co-mutagenic properties. The formation of co-mutagenic effects of ascorbic acid depend on its concentration, irradiation dose, and the efficiency of repair processes. Co-mutagens may pose high carcinogenic hazard at low (above background) radiation levels." Thus, in this lymphocyte cell study, in the cancer patients, the low-dose radiation and ascorbic acid in the therapeutic range potentiated gentic damage = 1.7 times higher than just the irradiated cells. EDITORS' NOTE: This is just a cell study, but shocking to think that the name of ascorbic acid has been blackened by being called a co-mutagen along with x-rays. .... How could this be? .... Please forgive our rank speculation, but could the ascorbic acid have been, unwittingly, GMO? Or, since this is Russia, could the ascorbic acid have been radioactive, which added after x-rays, would have potentiated the chromosome damage? Especially in the blood of cancer patients, like in this study, it is understandable that the weakened immune systems of the cancer patients could not make any repairs. ... Definitely relevant, and definitely, the peculiarities of ascorbic acid! In their 2015 study, Huijskens MJ et al. stated that,"Natural killer (NK) cell-based immunotherapy is a promising treatment for a variety of malignancies." But being able to make enough NK cells for therapy is a "challenge". While expanding mature NK cells from peripheral blood mononuclear cells in the presence of anti-CD3 monoclonal antibodies and interleukin-2, among other things, why not try adding ascorbic acid to see if it would boost the NK numbers? Results: "Addition of ascorbic acid (AA) resulted in more proliferation of NK cells without influencing NK-cell functionality ..... NK cells expanded 2362-fold (median, range: 90-31,351) in the presence of AA and were capable of killing tumor cells under normoxia and hypoxia. Moreover, hematopoietic stem cell-derived progenitors appeared to mature faster in the presence of AA, which was also observed in the NK-cell differentiation from early T/NK-cell progenitors." THYMUS GLAND PRODUCES OUR T-CELLS. CAN VIT. C PREVENT THYMUS GLAND ATROPHY IN MICE AND HELP THEIR IMMUNE SYSTEMS? HOW ABOUT IN ELDERLY PEOPLE? "These findings suggest that high dietary intake of vitamin C over a long period contributes to sustaining immune cells, and could be effective in improving immune function in elderly people by preventing a decline in the number of immune cells." Ushio R et al., 2015. YES!, in mice, and the study suggests YES in elderly people, too! In the Uchio R et al. 2015 study, the thrust of their research was to determine if taking vitamin C can help us maintain our immune systems as we age. To conduct their research, the researchers chose a vitamin C-deficient mouse model and "investigated the effects of long-term high-dose vitamin C intake on age-related changes in immune status." To this end, mice were given the daily dietary requirement of vitamin C or high-dose vitamin C for one year. Specifically, this equated to the recommended amount of 20 mg/kg per day (0.02% Vitamin C), or a high level of vitamin C - ten-fold higher - in the amount of 200mg/kg per day (0,2% vitamin C) for one year. At the end of a year, in order, "To investigate the effect of high vitamin C intake on age-related changes in immune cells, we measured the total number and the populations of leukocytes (white blood cells), splenocytes ('such as T and B lymphocytes, dendritic cells and macrophages, which have different immune functions', wikipedia.org), and thymocytes (from the thymus gland, thymocytes help produce T lymphocytes)." Background: The aging process affects our immune systems, making us more subject to infections, with an increased risk of cancer. "The thymus is a central lymphoid organ responsible for the production of naive T (the "T" is from thymus, where these white blood cells are produced or processed) cells, which migrate to the peripheral lymphoid tissues." As we age, there is an involution of the thymus gland, in which the gland actually changes in size and weight, and there is a consequential "decrease of cells entering the peripheral T-cell pool. Chronic involution of the thymus is thought to be one of the major factors contributing to the decline of immune function with increasing age." So, why would vitamin C be helpful? We know that vitamin C has many virtues, including as an antioxidant and in its ability to help make collagen and L-carnitine. Thus, vitamin C is known to help the immune system. But does dietary vitamin C in mice help their immune systems, by partly helping to ameliorate the atrophying thymus gland? "In the 0.2% diet group, which is ten times the RDA, the vitamin C was able to "inhibit age-related thymic atrophy and maintain immune cells, such as leukocytes, thymocytes, and splenocytes." in the mice. The T cells in the peripheral blood and memory T-cell populations of splenocytes was "significantly higher" in the 0.2% diet than the 0.02% diet of vitamin C.
Conclusion: Hooray, high-dose vitamin C can inhibit age-related thymus gland atrophy and a decline in the immune cells! "These findings suggest that high dietary intake of vitamin C over a long period contributes to sustaining immune cells, and could be effective in improving immune function in elderly people by preventing a decline in the number of immune cells." In their 1978 reevaluation of the prolongation of survival in terminally ill cancer patients, Cameron and Pauling studied "the survival times of 100 terminal cancer patients who were given supplemental ascorbate, usually 10 g/day, as part of their routine management and 1000 matched controls, similar patients who had received the same treatment except for the ascorbate." Results? The researchers again found "strong evidence that the treatment of patients in Scotland with terminal (untreatable) cancer with about 10 g of ascorbate per day increases their survival significantly (by an average of about 300+ days). Larger amounts might have a greater effect." *Eight of the 100 terminally ill ascorbate-treated cancer patients were still alive 3.5 years later. *Twenty-two of the 100 terminally ill ascorbate-treated patients lived over a year, with an average of 2.4 years. Conclusion: "There is little doubt, in our opinion, that treatment with ascorbate in amounts of 10 g/day or more is of real value in extending the life of patients with advanced cancer. Moreover, ... the quality of life of the patients is improved by the administration of ascorbate. Also, we continue to believe that the addition of ascorbate to treatment regimens at an earlier stage might well have a much greater effect, increasing the average time by several years." For high-dose ascorbate to be effective in cancer patients, there has to be a high enough amount of ascorbate in the tissue to induce a reactive oxygen species (ROS) concentration that is "above a toxic threshold". Thus, " In patients, the ascorbate concentration shown to induce cytotoxicity to cancer cells in vitro can only be achieved via IV administration." 10 grams of IV ascorbate yields 6mM (micromolar) plasma concentration, which is 25 times higher than if the 10 grams had been taken orally. Between 26 - 50 grams of IV ascorbate yields 10-30 mM ascorbate peak concentrations. 70 grams of IV ascorbate yielded 49 mM concentrations in some people. "Thus, up to 70-fold difference of plasma ascorbate concentration can be obtained simply by changing the administration route (oral to IV)." HOW DOES VITAMIN C WORK IN CANCER CELLS? VITAMIN C IS AN ANTIOXIDANT AND PRO-OXIDANT! HIGH DOSE IV VIT. C! "The best known prooxidant antioxidant at this time is intravenous high-dose vitamin C. While vitamin C at regular oral doses has an antioxidant effect just like any other antioxidant, if it is given in high doses – like 50 grams a day, much more than you can take in supplements – it turns into a prooxidant, and appears to kill cancer cells. The prooxidant activity is triggered because of iron and other metals that are abundant in tumor tissues. When vitamin C interacts with these metals, it starts to behave like a prooxidant. The cancer-killing properties of high-dose vitamin C have been validated in laboratory studies, and there are many small studies and case reports on its apparently beneficial effects in cancer patients. ..
​ .. Note that you can’t use oral vitamin C supplements for this effect. Even if you felt like taking dozens and dozens of vitamin C tablets daily, your body closely regulates how much vitamin C can be absorbed through the digestive system. Vitamin C must be administered intravenously, bypassing your digestion, in order to reach prooxidant levels." HIGH DOSE VITAMIN C MAY BE EFFECTIVE ​AGAINST CANCER CELLS A COUPLE OF REASONS WHY! "...Our findings suggest that vitamin C promoted cancer cell death by inhibiting energy metabolism via NAD (nicotinamide adenine dinucleotide) depletion, induced by H2O2 (hydrogen peroxide) generation." ​ Uetaki M et al., 2015 SEE BELOW. "Higher plasma ascorbate results in increased penetration of remote and hypoxic (low oxygen) regions and the ability to down-regulate HIF-1 (hypoxia-inducing factor) by promotion of the regulatory hydroxylases. HIF-1 mediated changes that regulate the tumor glycolytic phenotype, cell survival pathways, and angiogenesis could be affected, decreasing tumor viability and improving treatment outcomes." ​ Caroline Kuiper and Margaret Vissers, 2014. High-dose vitamin C "induces pro-oxidant effects and selectively kills cancer cells". In their 2015 study, the Uetaki M et al. team sought to determine the mechanisms of action for vitamin C's effect on cancer. Studying breast cancer cells and colon cancer cells in culture, the researchers analyzed metabolic changes upon administration of vitamin C.
"In conclusion, our findings suggest that vitamin C promoted cancer cell death by inhibiting energy metabolism via NAD depletion, induced by H2O2 generation." NAD (nicotinamide adenine dinucleotide) involves electron transfer. From wikipedia.org: "In metabolism, NAD is involved in redox reactions, carrying electrons from one reaction to another. The coenzyme is, therefore, found in two forms in cells: NAD+ is an oxidizing agent – it accepts electrons from other molecules and becomes reduced. This reaction forms NADH, which can then be used as a reducing agent to donate electrons." Indeed,"Further investigations are required to elucidate the specific mechanism by which NAD depletion mediate the vitamin C-induced cytotoxicity." 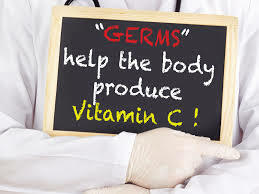 PEOPLE CAN'T MAKE VITAMIN C --- OUR BACTERIA TO THE RESCUE?? It has long been thought that people, unlike most animals, can't make vitamin C due to a mutation in the gulonolactone oxidase gene. "Groundbreaking new research indicates that humans are capable of synthesizing vitamin C via their highly complex and capable microbiome." In a fascinating 2015 article, Sayer Ji wrote about the Bacteria as Vitamin Suppliers to Their Host: A Gut Microbiota Perspective study, which entertained the idea of bacteria making vitamin C and other vitamins. "The remarkable paper focused on the role of food-related lactic acid bacteria (as found in cultured foods such as yogurt) as well as human gut commensal such as bifidobacteria and their ability to produce the vitamins we are not able to produce ourselves. 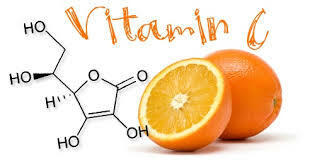 The highlight, of course, was the discovery that bacterial isolates from human gut samples were capable of producing a wide range of vitamins, including vitamin C (ascorbate). ..... Unfortunately, the paper did not discuss the methodological details as to how exactly they uncovered this fact." So, not knowing which bacterium or bacteria could be involved in actually making vitamin C in our bodies, Sayer Ji went to his database to try to figure out plausible bacterial candidates. "Corynebacterium glucuronolyticum (ATCC 51867), which contains an L-ascorbate biosynthesis pathway." Sayer Ji characterized this bacterial strain. "Interestingly, most Corynebacterium species are considered benign, but C. glucouronolyticum has been been linked to human urogential infections, and C. diphtheria is associated with opportunistic diphtheria infections. Emerson once said that a weed is an herb whose virtues have yet to be discovered. So too may be the case with 'germs.' A nuisance, perhaps, may grow into greater numbers when the body is suffering from a deficiency of one of its primarily biosynthetic pathways and associated biomolecule, be it a vitamin, anti-tumor agent, or antibiotic. It is possible that C. glucuronolyticum grows into 'infectious'' proportions when the body is starved in vitamin C, and that when the body is replete with vitamin C the normally benign strain does not contribute to urogenital infection." Sayer Ji conceded that even if we are able to make vitamin C from Corynebacterium, it might not be enough vitamin C for our bodies, that we are not "producing physiological relevant quantities of vitamin C via this strain alone."